Our customers know, at Sports Cards Plus, a.k.a. The Super Hit Factory you always get more. Our $500.00 Drawing Winners are: Jim Resendez $100, Brandon Harty $100, Chris Patterson $100, Matt Krunk $100, and James Coulter $100. Thanks to The BEST CUSTOMERS in The World for filling up our Drawing Ticket Jar. Next $500.00 Drawing is November 29th at 6:30 p.m. at The Factory. Our LABOR DAY SALE continues. Here's your chance to pick your box from The BEST CASES in The Hobby at LOW, LOW, LOW Prices. Our 2013-14 National Treasures Hockey 4-BOX Case Group Break is Friday at 6:00. Every $69.99 Slot will be randomly assigned a team and will receive all cards pulled for your randomly assigned team from a 4-Box Sealed Case (44 cards). Slots available at $69.99 each. It's going to be fun. Call 210-524-2337 to reserve your slot TODAY. Click Green link below to see a previous 2013-14 National Treasures Hockey break. See break live on Friday. 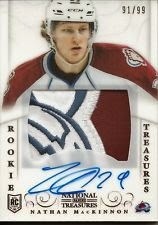 http://www.ustream.tv/search?q=SportsCards-Plus . Come by Sports Cards Plus and see our Break Live. Nate pulled his third Michael Jordan Autograph in 10 days. Nate has pulled 30 to 40 (he lost count) Michael Jordan Autos in the last two years. What is Nate's secret? Nate knows The BEST CASES in The Hobby are at Sports Cards Plus. Nate buys all his boxes at The Super Hit Factory. Here is Nate with his latest Jordan auto, a 2012-13 Upper Deck Exquisite Basketball Michael Jordan, Julius Erving, Magic Johnson Triple Auto #d/10. 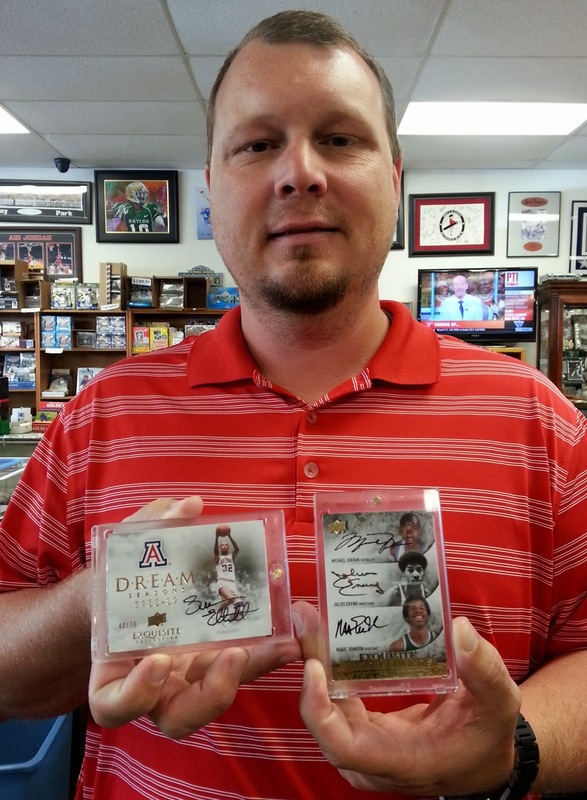 This new customer quickly discovered, the BEST CASES in The Hobby are at Sports Cards Plus. He picked a box of 2012-13 Panini Timeless Treasures Basketball for ONLY $41.99 and pulled this Kyrie Auto RC! James came in to try some golf. His box of 2014 SP Authentic got him this Gary Player auto and his box of 2014 Upper Deck Exquisite got him the Arnold Palmer Autographed Game Used Shirt #d 23/25. James knows at Sports Cards Plus, you always get more. His purchases got him FREE tickets to our $500.00 Drawing. James is one of our $100 WINNERS. Dave came in to try a box of 2014 Topps Chrome Baseball for ONLY $69.99 per box. Dave's box was a hot box with all cards in the box being refractors. Due in this week is 2013-14 Immaculate Basketball. Preorder your box TODAY at Sports Cards Plus for ONLY $399.95 per box. Last year's Immaculate is currently $600 per box. Reserve your box of 2013-14 Immaculate TODAY and save some money. Here's Mark with his favorite hits from last year's Immaculate. Be like Mark and pick your box from The BEST CASES in The Hobby.